Does Excel Really Excel At Rate Management? Imagine you’re at the supermarket .. but checkout is taking hours. To price every item, the cashier looks at a gigantic Excel spreadsheet. When it’s not there, the cashier calls the head office to get the price. Satisfied? Confident that you’re being charged correctly? Well, this is what happens every time a shipper tries to get a spot quote. We know that rate management is an ongoing nightmare for most forwarders. For many of them, Excel is still the default “automated” freight pricing system. So is it Excel’s fault? Or is rate management doomed to hold back freight sales? Rate management supports tender and spot quote activities for freight forwarders. 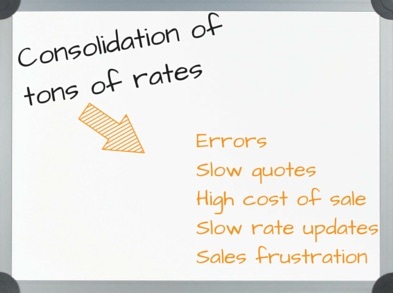 Managing rates for spot quoting is messier than managing negotiated contract rates. But even logistics providers who specialise in tenders still regularly follow up with spot requests from their overseas agents or carriers. And trouble is, a single spot order could cost hundreds of dollars of labor for a forwarder. Unlike tenders, spot business margins are generally high. New shippers may try out new forwarders with spot business before committing more capacity. Ok, case proven, effective freight rate management is a crucial task. So is Excel the problem? It’s seems almost disrespectful doubting Excel. Just over thirty years old, Excel is now used by EVERYONE, powering governments, small and mid-size businesses and more. But just because everyone is using it doesn’t mean that it’s a perfect fit for forwarders. Carrier rates come from many companies with each spreadsheet structured differently. And sometimes its not even a spreadsheet – it could be as PDF, Word or even a picture. Smaller forwarders, with fewer rates, can get by with storing these different docs on a shared folder. Larger logistics providers with hundreds of rates will want to consolidate wherever possible to increase quoting efficiency and reduce the chance of error. Most will end up with several different templates, for instance one for each mode of transport, with every spreadsheet having a worksheet for individual carriers. Port surcharges will need a completely separate template. And so on. Sales and pricing teams struggle to find the correct rate from the many rows on several workbooks of several differently structured spreadsheets. Reminds you of that checkout line held back by spreadsheets, right? But wait, there might be a better way! Many forwarders consolidate the rates on Excel models that the computer geek in the pricing team created. How many tech savvy Sales reps do you know? You think most of them are great at navigating Excel spreadsheets with many very similar looking rows, or mastering complex Excel functions? At least $680 million is lost annually on invoicing errors alone, with inaccurate quoting also hurting trust and shipper relationships. These rates expire all the time. Updating can be a error-prone nightmare. No wonder many pricing teams are reluctant to hand over their models to sales reps. So the sales guy calls in or emails the pricing team, and the pricing analyst checks his beautiful model. Now, that pricing analyst has placed himself right on the critical path for closing a sale. What if he’s not around? Or your agent’s pricing guy is in a radically different timezone? Remember that supermarket checkout cashier calling head office to confirm prices? Ever worked in a business heavily relying on a complex Excel model that gets corrupted and dies? Or potentially worse still, maybe it kept on working but with costly errors that are finally uncovered months later? (like for instance, JP Morgan once lost billions of dollars from a stupid Excel error). Models require on-hand expertise to build, maintain and at times, to urgently trouble-shoot and fix. Those rates are regularly changing too. The pricing guy needs time to change, upload, verify and broadcast. Freightos’s COO was sitting in the office of a major multinational forwarder’s pricing manager nine days before Christmas. The pricing manager opened up an email that had just hit his inbox. It was from a major carrier announcing a special for air freight between New York and London valid until Jan 2nd. and ensure that they knew the details, in time for them to be able to sell it. This is a lose-lose-lose. Carrier lost out, forwarder lost out and shipper lost out. Simply because there was no way of keeping rates up to date and communicating them in an efficient way. There are other freight rate management issues that Excel struggles with, like multi-currency quotes, or having rate information available in several languages. If you are a forwarder whose business uses Excel you can no doubt come up with several more bugbears. It’s no wonder that some forwarders have bit the bullet and have replaced their spreadsheet nightmare with a rate management system.